If you are researching an Irish ancestor, be sure to clear your appointments for July 8, 2015 (except for your 9pm eastern U.S. appointment with Thomas MacEntee's webinar). That is the anticipated date of the release of the digitization of the entire collection of Catholic parish registers held by the National Library of Ireland. More than 390,000 digital images of these records will be online and available for free. Read more about it in their recent press release below. Judy Wight spoke about this in her recent webinar, "Irish Genealogical Records in the 17th-19th Centuries. Webinar subscribers can watch the recording here, or here's a 15-minute preview. These records updates are among my favorite announcements! It's always fun to see what new records FamilySearch has. Thanks to all the indexing volunteers for making this possible! FamilySearch has added to its collections more than 15.6 million indexed records and images for Australia, Canada, Czech Republic, India, Italy, Mexico, Peru, Philippines, and the United States. Notable collection updates include 5,573,816 records from the US, Iowa, State Census, 1925 collection; 2,086,638 records from the US, California Death Index, 1905–1939 collection; and 1,325,362 images from the Italy, Cremona, Civil Registration (State Archive), 1744–1942 collection. See the table below for the full list of updates. Search these diverse collections and more than 5.8 billion other records for free at FamilySearch.org. Searchable historic records are made available on FamilySearch.org through the help of thousands of volunteers from around the world. These volunteers transcribe (index) information from digital copies of handwritten records to make them easily searchable online. More volunteers are needed (particularly those who can read foreign languages) to keep pace with the large number of digital images being published online at FamilySearch.org. Learn more about volunteering to help provide free access to the world’s historical genealogical records online atFamilySearch.org . There's a new place for Legacy Family Tree users to hang out! Join our new Legacy User Group on Facebook today to share ideas, ask questions, or just lurk. Or if you're thinking about using Legacy, come hang out in the group and see what others are saying. Look for the Legacy User Group link in your Facebook "GROUPS" panel (it's on the left). Click on it and read what others have written, post a comment, or ask a question. Funeral and Memorial Cards are often overlooked as a genealogy resource. They can be a treasure trove for the genealogist as they usually contain detailed information on the deceased person, such as birth and death dates, funeral location and burial location. Sometimes a memorial photo of the departed loved one is also found on the card. During the 17th and 18th centuries, small memorial cards or invitations were often sent to inform friends and neighbours that someone had died. These cards were seen as an invitation to a funeral as well as a funeral notice. If the deceased was someone of great importance, the card usually had to be shown in order to attend the funeral. Funeral and Memorial cards are a genealogical treasure. In Victorian times (ca 1837-1901) mourning customs were comprised of rituals and strict rules of etiquette and these were rigidly followed by most individuals. Mourning and funeral rituals were quite strict and anyone who did not wish to be ostracized tried to follow the social customs. This was the time period when mourning jewellery became popular and custom jewellery containing a lock of the deceased person's hair was often made for a widow to wear. Funeral Card 1896. From private collection of Brian Massey. Funeral cards were very popular in the 19th Century. After a loved one died, a family member was expected to let others know of the time and date of the funeral. That is where Funeral Cards came in. The deceased's love ones could order from dozens of styles of cards and have them imprinted with the deceased's name, date of birth and death, age and when and where the funeral was to be held. Often a standard verse was included. Sometimes there was a photo of the deceased or an image such as an angel if the card was for a child. These cards were usually 4x6 inches and viewed vertically. A commonly used colour was black with gold lettering. A child's Funeral Card was usually white. Child's Funeral Card 1902. From private collection of Brian Massey. After printing, funeral cards were sent or given to family members, friends, and the surrounding community. Recipients of a funeral card were expected to attend the funeral or risk offending family members. Conversely, those who did not receive an invitation would have been insulted, whether it was intentional or an oversight. Funeral cards were sometimes kept as a memento of a person's passing. They often turn up in antique stores, auctions, flea markets, or attics where they have been stored and forgotten. Memorial cards did not have the same purpose as a funeral card. These small cards were sent out after the funeral and often contained more details of the burial location as well as a memorial to the deceased. Usually the name of the person as well as birth and death dates and location of death were included. These cards were usually 3 x 4 1/2 inches and viewed horizontally. They often had elaborate mortuary designs. Often a thick black border was used on Memorial Cards. If there was enough room a poem or verse might be added. Small folded 4-sided Memorial card 1919. From private collection of Brian Massey. By the 20th Century these Memorial and Funeral cards were out of style and Victorian rules of etiquette were rapidly changing. The cards evolved into other designs, usually a folded 4-sided vertical Memorial Card given out at the Funeral. A photo of the deceased and a great deal of genealogical information was usually included. Today's Memorial or Funeral Cards can come in a variety of designs and shapes. They might be bookmarks, or a card similar to a Sympathy card. Families can have their card of choice printed through the Funeral Home or a Printing House. Often a photo of the deceased or of something of significance to that person is included. A poem or religious verse is often added. Some Memorial cards are religious in design and will have religious symbols and relevant religious or biblical verses included. Research in the South can be both challenging and rewarding. Historically, the southern states’ culture and economy have been deeply rooted in agriculture. As an agrarian society, many areas were not meticulous in keeping records. When living on farms any significant distance from the courthouse, taking care of business at home took precedence over a lengthy trip to the courthouse. Births and deaths might not be recorded until months or years later. Deed transfers within the family might not be formalized for a generation. As a researcher of the American South, it is imperative to understand the agrarian way of life. Another challenge for the Southern researcher is burned counties. Many counties have lost records over the years to fire and/or natural disasters. Certainly the Civil War played a role in the loss of courthouse records. While research in a burned county can present a brick wall for the researcher, the brick wall is not insurmountable. Don’t despair! Research of your southern ancestors will still be a rewarding experience. The State Archives – More and more records are becoming available online for the genealogy researcher. A good place to start is with the state archives where your ancestors lived. Each state will have its own unique holdings. For example, if you have North Carolina ancestors, visit the State Archives of North Carolina website. You will be able to search their holdings and explore their digital collections. Examples of what you will find include family Bibles, Civil War Pension Applications, and War of 1812 Pay Vouchers. The State Library and Archives of Florida’s Florida Memory Collection is another good example of using a state archives’ available online records. On their site a sample of what you will find includes Spanish land grants, WWI Service Cards and Civil War Pension Applications. State and Local Genealogical Societies – The amount of information found on state and local genealogical societies will vary quite a bit. The information is usually provided by the society’s volunteers. Still, be sure to check these societies for where your ancestor lived. Depending on the individual society, variable local records will be available. For example, transcripts of individual will and deeds might be found. Photographs of local residents and landmarks are another example that may be found. Some of the information may only be available to the society’s members while others are available to the general public. These sites are certainly worth a look. Documenting the American South (DocSouth) – The University Library at the University of North Carolina at Chapel Hill (UNC) sponsors this online resource for southern history, cultural and literature. Among its collections are first person narratives of slaves, women, farmers and soldiers. Other collections include personal diaries and papers relating to the Civil War and slave narratives. DocSouth is an invaluable resource for any southern researcher. The Library of Virginia – While obviously focused on the records of Virginia, many southern families of other states such as Tennessee, Georgia and Alabama can trace families back to Virginia. The LVA website is also a valuable resource for learning about the southern culture and way of life. The Digital Library on American Slavery – If you have African American ancestry, this site sponsored by the University of North Carolina at Greensboro is an excellent place to visit. Many slave deeds, runaway slave advertisements and slavery era insurance records may be found here. Remember: For all the excellent records available online, there are many more that are not. To be complete in your research, sometimes you need to travel to a repository or use the assistance of a local genealogist. Now…. Go grab a tall glass of iced tea and start exploring your southern roots! Lisa Lisson is a genealogist, blogger and Etsy-prenuer who writes about her never-ending pursuit of ancestors, the “how” of genealogy research and the importance of sharing genealogy research with our families. Specializing in North Carolina and southern Virginia research, she also provides genealogical research services to clients. You can find Lisa online at Lisa Lisson.com. Tomorrow we leave to begin our 12th annual Legacy Genealogy Cruise, this year to the Western Caribbean. We will depart from Fort Lauderdale, Florida and visit Labadee, Haiti; Falmouth, Jamaica; and Cozumel, Mexico. We will sail on Royal Caribbean's Oasis of the Seas. We've also got lots of genealogy and Legacy classes planned and lots of time for one-on-one and small group sessions. And for the first time, I'll be bringing along my four young budding genealogists. Our kids have heard about our cruises all their lives, and now it's their turn to explore other countries and eat as much ice cream as they can handle. Yep, they're excited, and so am I! It's good for 10% off anything at www.LegacyFamilyTreeStore.com or www.FamilyTreeWebinars.com through Monday, June 29, 2015. Our sincere thanks go out to our entire technical support and sales staff who will continue to provide sales and support services while we are away. Thanks Jim, Sherry, Brian, Michele, Sarah, Bryan, Marian, Jairmie and Leonard for keeping us afloat! How to Get More Out of Legacy Webinars - with Little or No Time! 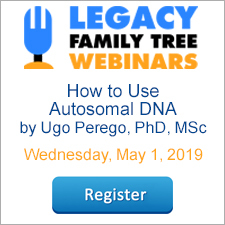 One of the greatest educational treasures in genealogy is the Legacy Family Tree webinars series which broadcast live nearly every Wednesday of the year. As a free resource, they provide some of the best ongoing genealogy education available right from your computer. But keeping up with the webinars can be a challenge. You don't always have time to view each one. If you have absolutely no time on your hands to catch up with a Legacy webinar you can still benefit from it. Use the webinars as a prompt. Let's take two recent webinars as examples: Migration Patterns East of the Mississippi Prior to 1860 by Mary Hill and American Revolution Genealogy by Beth Foulk. During the course of your day you'll see the titles come across your screen either in an email or on Facebook, Twitter or Google+. Make a mental note of the title. Then when you are driving, on your lunch break or taking a walk think about the topic and how it might apply to your ancestors. Did you have ancestors who migrated from one place to the other prior to 1860? Did you have any Revolutionary War ancestors? Genealogy Research is not all about searching databases or microfilm. Thinking about your ancestors and analyzing what you know is just as critically important. Allow the titles of the weekly webinars to prompt you to think about your ancestors. You will start to ask yourself new questions and then when you have free time you'll be able to seek out the answers. 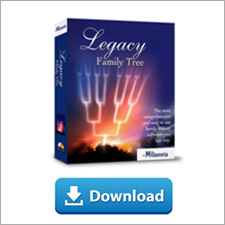 With only 15 minutes you can push your genealogy forward. Again, use the webinar titles as prompts. When you have 15 minutes in front of your computer do some searches related to the titles and see what you can find. For migrating ancestors, pick an ancestor in your Legacy database that lived before 1860. Then in the My Toolbar tab select the Map Family option. Now you can view a map of all the locations where your ancestor lived. You can also press the play button and watch the progression of your ancestor's life journey. Next, decide whether you have researched each location thoroughly enough. If not, come up with some research tasks and save them so they can be done when you have more time. In the case of Revolutionary War ancestors, do a search for ancestors born between 1726 and 1767. You can do this by going to the Legacy My Toolbar tab and then selecting the Search button. In the primary condition box search for a birth date after 1725. Using the "And" function add a second condition of birth date before 1767. Next, choose create list. While women did participate in the American Revolution, your search results will be more manageable if you search for only males. When the list comes up print it out for future research. If you're a Legacy webinar subscriber and have to wait to watch a webinar, you can still benefit each week. Make a point of printing out the handouts. During your lunch break, visit some of the internet links listed in the handout. For the Migrations East of the Mississippi, spend some time visiting the websites Migrations.org or Historical Maps of the United States from the University of Texas. See if you can learn something new about the places and routes your ancestors took. For the Revolutionary War topic visit websites such as the Daughters of the American Revolution (DAR) or the National Archives and do some searches on your Revolutionary War ancestors. You see, even if you're too busy to take advantage of Legacy webinars every single week you can still benefit from them! Use the webinars titles as weekly prompts that lead you to think about your ancestors, help your plan your research tasks or take you on a brief adventure visiting genealogy websites.